Edgewood, NY – September 17, 2018 -- U.S. Alliance Paper will exhibit at the 2018 PLMA show in Chicago on November 12 and 13, and invites customers and visitors to Island Booth H 2105. U.S. Alliance Paper has grown to one of the largest private label household paper manufacturers in the country by focusing on superior quality, reliability and service. The company helps retailers build out their paper program with a full range of product tiers, from value to premium and super-premium, and paper grades: TAD (Through Air-Dried) technology, FSC® (Forest Stewardship Council®) certified products, recycled and traditional. In addition, U.S. Alliance Paper offers control brands to retailers with lesser volume requirements: Azure Ultra-Premium towels and bath tissue; Earth First line of products, 100% recycled with 80% post consumer material and no chlorine bleaching; the Daisy line of kitchen towels, bath tissue, napkins, and facial tissues specifically for the discount and dollar store segments of trade; and the Delicate Touch line with consumer-tested package configurations for grocery and mass. Stop by and “feel the difference” in quality, and discuss how to optimize your paper program and your bottom line. Please contact Steve Saraf, VP Sales, at info@usalliancepaper.com or 631-254-3030 to schedule a personal meeting at the show. Headquartered on Long Island, NY, with additional plant and distribution facilities in Phoenix, AZ, the company delivers superior price-value products to consumers, and a competitive advantage over national brands to its retail partners with award-winning service, flexibility and reliability. PLMA’s 2018 Private Label Trade Show will be held at the Rosemont Convention Center, only 10 minutes from Chicago’s O’Hare International Airport. On November 12 and 13, more than 1,500 companies from 40 countries will be exhibiting their products, including 25 international pavilions. U.S. Alliance Paper at PLMA, "Come Feel the Difference!" Edgewood, NY -- October 10, 2017 -- U.S Alliance Paper will feature its newest control brand, Ultra Premium Azure, at the PLMA Private Label Trade Show on November 13th and 14th in Chicago. Visitors are invited to stop by Island Booth H 2105–2209 to “feel the difference” for themselves. U.S. Alliance Paper had been manufacturing ultra-premium household paper products for its larger private label customers with very positive results – customers enjoy the higher margins and their consumers love the premium product attributes. Demand from smaller retailers, who may not have the volume requirements for their own private label program, was growing at the same time, and the Azure control brand was developed as a way to offer them the same benefits. Ready-to-shelf in eye-catching packaging, the award-winning Azure line offers retailers the opportunity to boost their margins with value products in premium quality tiers. The 2017 PLMA Show will be held at the Rosemont Convention Center in Chicago on November 13th and 14th. More than 1,300 companies from 40 countries will be exhibiting their products, including 25 international pavilions. For more than 30 years, PLMA’s annual trade show has been the industry event of the year, where retailers and wholesalers source for their private label programs. Edgewood, NY - June 21, 2017 - U.S. Alliance Paper is proud to introduce its new Azure line of ultra premium towels and bath tissue to retailers who may not have the volume for private labeling – in ready-to-shelve, eye-popping packaging. With the addition of the ultra premium Azure line to its Daisy, Delicate Touch and Earth First control brands, U.S. Alliance Paper offers small- and mid-market retailers the ability to develop a strategic paper program to represent all quality tiers at value pricing. They can now offer their consumers the same TAD (Through Air-Dried) ultra premium products that have performed so well for larger private label customers. In the TAD process, virgin fiber is dried by passing extremely hot air through to develop a soft and airy structure, rather than pressing and flattening the fiber, giving consumers the “fluffier”, stronger, and more absorbent attributes they are looking for. 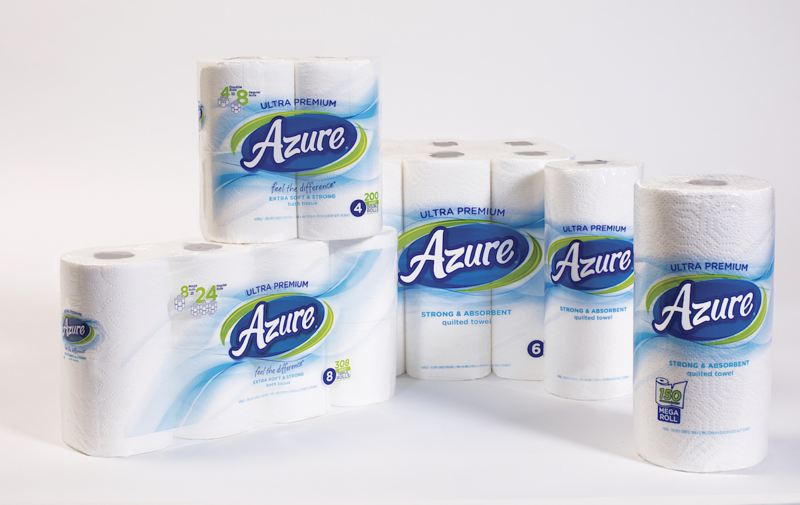 Azure ultra premium paper towels are designed to maximize consumer convenience in a single 150-count mega roll, a single 52-count value roll, and a 6-pack 52-count value roll format. Azure ultra premium bath tissues are available as an 8-pack 308-sheet triple rolls, and a 4-pack 200-sheet double rolls. Edgewood, NY – April 3, 2017 – U.S. Alliance Paper took a top new products honor from Store Brands magazine in the second annual Editor’s Pick Awards program. Open to private label manufacturers and retailer self-manufacturers, a team of editors judged non-food products introduced in 2016 on innovation, functionality/quality and visual presentation, and awarded a bronze medal to U.S. Alliance Paper for its premium TAD paper products. The introduction of TAD (Through Air-Dried) technology has allowed U.S. Alliance Paper to effectively manufacture value products for the premium and super premium end of the spectrum. In the TAD process, virgin fiber is dried with extremely hot air to develop a soft and airy structure, rather than pressing and flattening the fiber, giving consumers the “fluffier”, stronger, and more absorbent attributes they are looking for. Edgewood, NY – March 15, 2017 – For four consecutive years, U.S. Alliance Paper has been awarded the Private Label Trailblazer Award by Grocery Headquarters magazine. Grocery Headquarters is a monthly publication featuring news, research, marketing and merchandising trends for decision makers in the grocery channel.